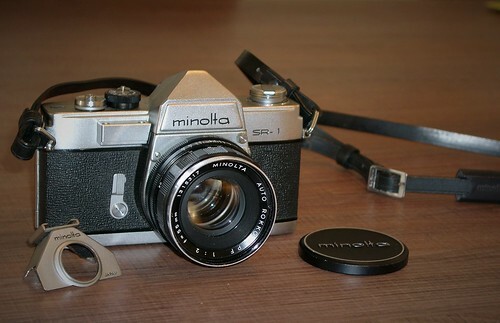 The Minolta SR-1 was launched in 1959 as the second 35mm SLR camera from Chiyoda Kogaku. There is actually not much difference between this and the first one, the SR-2. It was obviously introduced as a low budget alternative, with the fastest shutter speed removed, and offered with a slightly slower standard lens, the six-element Auto Rokkor-PF 1:2 f= 55mm. Several versions of the SR-1 were introduced over the following years. In 1961 a rather bulky chrome bracket (1) with two holes at the top was added to the right-hand front of the camera for the separately available selenium exposure meter, requiring the model name to be moved to the opposite side on the front. The shutter-speed dial had already been modified to rotate without being lifted. 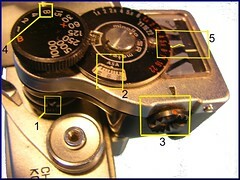 A small protruding pin was added to the shutter speed dial (2) to mesh with the meter (3). 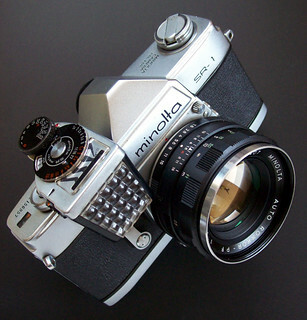 When the film speed and a suitable shutter speed is set, the meter shows directly on its scale the recommended aperture which must be set on the lens aperture ring. 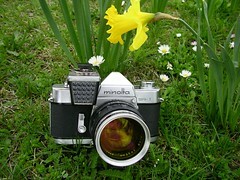 A light value system is provided on the early Minolta SR cameras, indicated by the yellow "LV"-index next to the shutter-speed dial, on which yellow numerals are engraved on the edge. Corresponding values in yellow is also engraved on the aperture ring on the appropriate Rokkor lens. For correct exposure, the sum of the numerals set on the shutter-peed dial and the aperture ring must equal the EV-value read on the meter (eg. 5 + 3 = 8 for 1/30 sec. at f2.8, when reading EV8 at the meter scale). 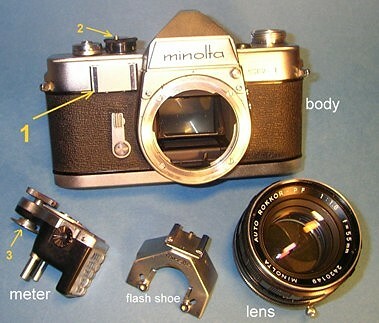 An accessory shoe to be attached to the finder eyepiece was separately available. It rests on top of the finder prism housing. In 1965 the SR-1 series V with significantly improved body was introduced, recognizable by a new body design without the stepped "shoulders", and a slimmer front-side meter socket. The finder eye piece became rectangular, requiring a series V accessory shoe. Also the wind-on lever became bulkier, and the strap lugs protrudes from the black part of the body rather than the chrome top. 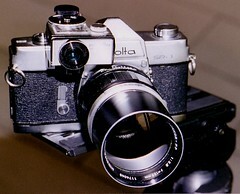 The last version, the Minolta SR-1s - introduced in 1967, has the additional 1/1000s shutter speed. The SR camera series's lens mount was a sophisticated new sort of lens bayonet. The lens had to be put into the bayonet ring of the camera body. There it had to be fixed by turning it 54 degrees to the right. By fixing it a tappet (1) of the shutter release mechanism got in contact to the aperture release lever (2) of the lens. For removing the lens the camera's lens unlock button had to be pressed. That way lens exchange was a secure procedure and a task of a few seconds. 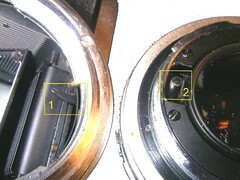 The meter is put into its holder and its shutter-speed selector's clutch connected correctly to the camera's selector's bolt (1). and the meter mode to be chosen (3). Shutter speed is chosen for each exposure with the meter's selector (4). The correct aperture is shown by the meter (5). Finally the aperture is selected at the lens manually. This page was last edited on 5 February 2018, at 06:17.